This was done on a residency in Hungary at Balatonfured on Lake Balaton. Lake Balaton is the largest fresh water lake in Europe. 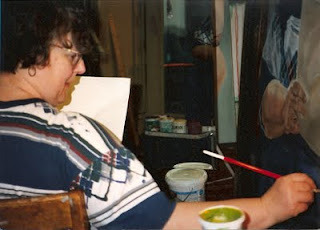 I spent a lot of time painting on the porch as I had ruptured my achilles tendon while in Budapest. That wasn’t actually confirmed until I got home. I spent 8 weeks in a boot and that was through most of my semester teaching. This and the beginnings of another self-portrait posted here were done during this residency. 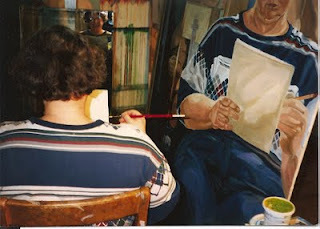 Here is another picture of me in the process of painting a self-portrait. The mirror in front of me is a little more obvious in this than in the previous post. More to come. The finished product can be seen on my other blog: contentdriven-davidaart.blogspot.com. 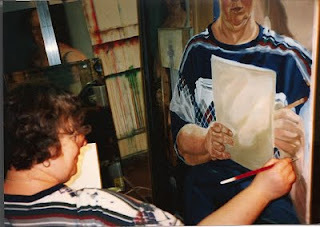 Here is another picture of me painting one of my large self-portraits. In the upper center of the picture you can just make out the mirror in front of me and the reflection of my arm in the mirror. There is also a mirror behind me which cannot be seen in this picture. So the mirror images are bouncing off of each other. You can see the finished product on my other blog: contentdriven-davidaart.blogspot.com. I came across some pictures taken my a friend of mine. I was working on a large self-portrait and she was fascinated by my set-up of mirrors. The self-portrait is was posted early on my other blog: contentdriven-davidaart.blogspot.com. There five pictures in all and I will be posting them over the next few days.This picture gives one a good idea of the scale of the piece. This a companion piece to the previous post. In fact, I consider these two pieces to be one work. Women can look at themselves in the mirror, try to be who they are not, and, in doing so separate themselves from how they really feel. It is a divorce from the body. If one cannot live comfortably in one’s body, how can one experience life fully? 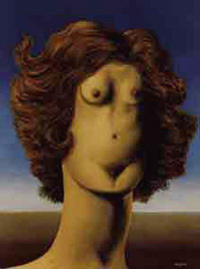 This self-portrait is one of two pieces. It, too, acknowledges the studio with the halogen work light in front of the venetian blinds in the background. I will write more about this and the next piece when I post it. Women are ridiculed for constantly primping in front of the mirror. (Vanity, usually painted by a man, has been historically represented as a woman before a mirror.) But our society insists that women be fashionably beautiful or attractive. Then if a women doesn’t conform she gets slammed again with ridicule. Besides fashion in beauty changes. There is no way to win, especially now, in a media driven consumer society. Women look at themselves and constantly find themselves lacking. This part is insufficent. That part is too sufficient. We find ourselves to be our harshest judges.So I painted myself as a collection of parts and a mirror for a head. The mirror is a metaphor for all the women who look in the mirror and don’t see what they can like. It is also a way to put the viewer in my shoes. They look in the mirror and see their heads on my body. Additionally, I have painted a post card reproduction of William DeKooning’s Woman One in my hand. Women must be either goddesses of beauty or they are monsters.